The VWR HeatBlock II Dry Heat Bath has a low-profile design and uniform heating with an easy to use control. This thermoblock has terrific conductivity thanks to the anodized aluminum sample blocks, giving you and even dry heat throughout. Each block comes with a thermometer well for external monitoring. This dry heat bath features two up front controllers for a gentle lower setting and a more intense higher setting. 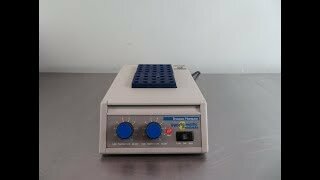 This dry heating bath is a great choice for applications such as culture activation, immunoassays, melting/boiling points, enzyme reactions and many more. These VWR HeatBlock II Dry Heat Bath have been thoroughly inspected and reached their temperatures without issue. All of our lab equipment comes backed with our standard warranty. Should you have any questions, please don't hesitate to contact us.